Product #2583 | SKU AT4041 | 0.0 (no ratings yet) Thanks for your rating! The AT4041 is intended for use in professional applications where remote power is available. It requires 48V DC phantom power, which may be provided by a mixer or console, or by a separate, in-line source such as the Audio-Technica AT8801 single channel and CP8506 four-channel phantom power supplies. Output from the microphone’s XLRM-type connector is low impedance (Lo-Z) balanced. The signal appears across Pins 2 and 3; Pin 1 is ground (shield). Output phase is “Pin 2 hot” – positive acoustic pressure produces positive voltage at Pin 2. To avoid phase cancellation and poor sound, all mic cables must be wired consistently: Pin 1-to-Pin 1, etc. An integral 80 Hz high-pass filter provides easy switching from a flat frequency response to a low-end roll-off. 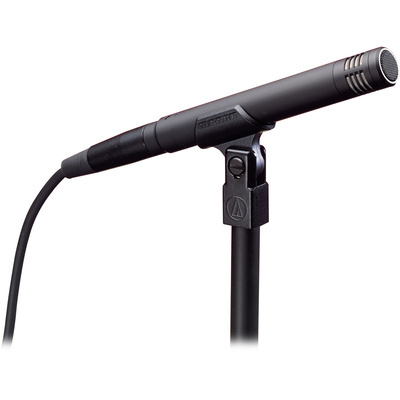 The high-pass position reduces the microphone’s sensitivity to popping in close vocal use. It also reduces the pickup of low-frequency ambient noise (such as traffic, air-handling systems, etc. ), room reverberation and mechanically coupled vibrations. Avoid leaving the microphone in the open sun or in areas where temperatures exceed 110° F (43° C) for extended periods. Extremely high humidity should also be avoided. Maximum Imput Sound Level: 145 dB SPL, 1 kHz at 1% T.H.D.